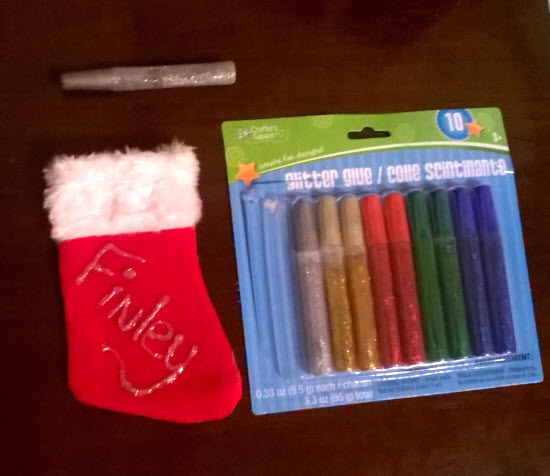 There were lots of displays with Christmas items for dogs and cats at the pet store, but nothing for Finley’s tank, so I decided to make some decorations for him. They are all outside the tank of course, but Finley loves looking at things that I put around his tank (Check out the post Betta Fish Fun: Art! to learn more about that). He seemed to enjoy the decorations, in fact, he liked the gold garland so much that I ended up cutting off a little piece of it to use in his art garden throughout the year. Draw the outline for the tree on a piece of paper. This step is especially important if you don’t get the shape right the first, second, third or fourth time as you can see I clearly didn’t. Then hold the drawing up next to your tank to make sure it will fit. Once you’re satisfied with your tree, trace it onto the felt, then cut it out. Use puff paint to make the garland. After 3 hours and the glitter glue still hasn’t dried, so only do this on the outside if you want to decorate your tank right away. The glue was dry in the morning though (I did think in the evening). Add the foam stars, saving the big gold stars for the top of the tree. Wait for everything to dry, then decorate the other side of the tree. 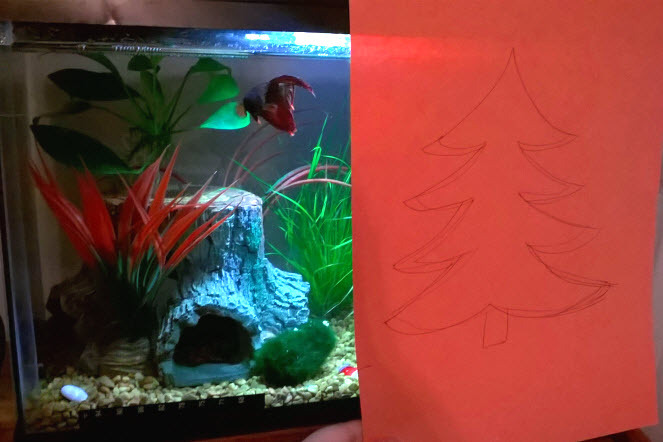 This way, both you and your betta fish get to enjoy the decorations. Finally, there are two ways you can hang the tree. Either only put a big gold star on the top of the outer side and leave enough of it hanging off the edges of the tree that you can just stick it right on the glass. Or, before you put the second big gold star onto the tree, glue a loop of string behind it (between it and the star on the other side) so that you can tape the string onto the tank with tape. I planned on doing the sting thing, but decided the sticker looked better. If I want to use it again next year, I’ll probably need to use the string though since the sticky stuff on the star will be dry by then. The wreath hanging over the doorway of Finley’s cave is a doll wreath. The lights are just small strands of white lights from Walmart that were about $2 each. I just taped them around the top of the tank. I did two strands around so that there would be more than enough lights for Finley to get to see them and also some sticking up to be festive for me. The gold garland I had, and the plastic Santa and reindeer on the top I also just had on hand, but you could probably find something similar at Walmart. The bow is from a 12 pack of Christmas bows that I got at the dollar store – it has a little bell in the center. And that’s it! There are a lot of really adorable Christmas decorations made for aquariums. Of course, only items made for specifically for aquarium use should go in your tank – anything else might have dangerous chemicals on it that can harm your fish, plants, or other tank inhabitants. Here are a few pictures of some great ones. All the images are clickable and link to the Amazon page for the items. As an Amazon Affiliate, I earn from qualifying purchases. The floating ball decorations are especially cute, but I’d worry that a betta would try to ‘fight’ it and it would have to be removed.